Think you—or someone you love—has an eating disorder? This practical, reassuring guide explains anorexia, bulimia and binge eating disorder in plain English, using non-triggering language. You'll also learn about related disorders such as "bigorexia" and compulsive exercise. Informative checklists help you determine your own eating disorder risk. Plus, you'll discover how to assemble a treatment team, find the right therapist, evaluate the latest treatments, and support your own or your loved one's recovery in day-to-day living. And there’s an entire section devoted to advice for families and others who care. Learn about eating disorders in special populations including men, children, performers, and middle-aged and elderly people. 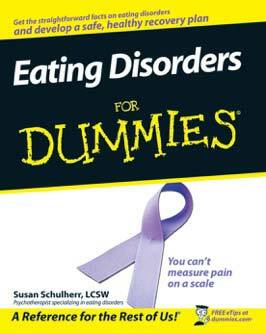 Eating Disorders for Dummies, a member of Wiley Publication’s acclaimed For Dummies series, provides one–stop shopping to fill you in on everything you and your loved ones need to get you started on the path to recovery.